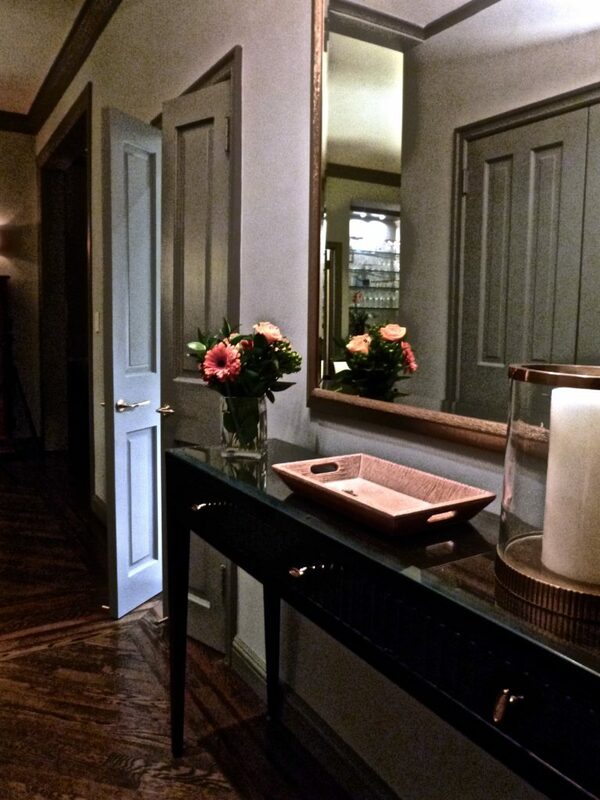 In this apartment renovation dark stained oak floors & deeply painted architectural woodwork were installed throughout the main areas of the space. 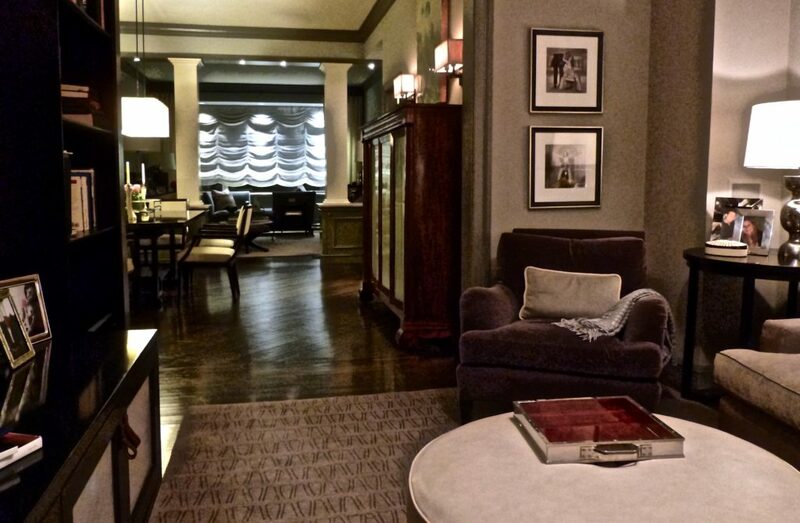 In the Dining Room the table sits to the left of the passage way to the Livingroom and a bar with open glass shelves was built into a nook on the right. 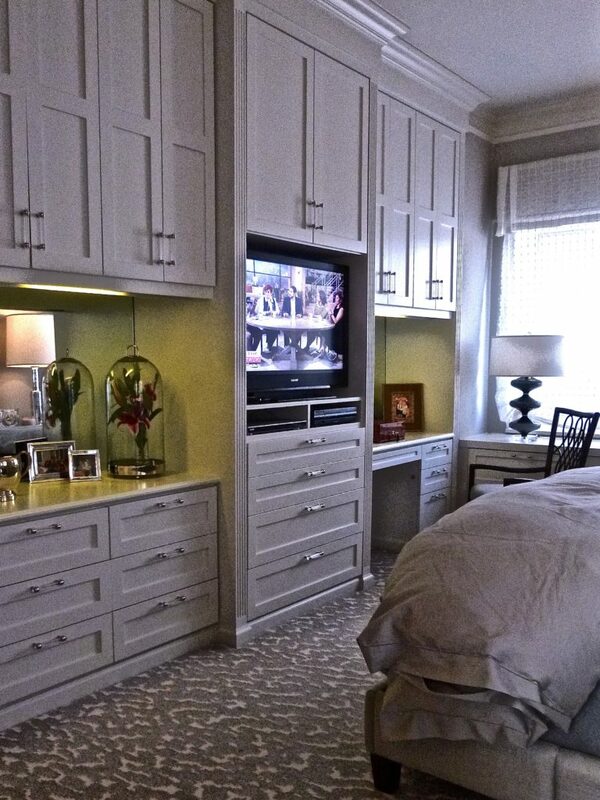 White columns were created above the stone tops of deeply painted custom built in storage cabinets. 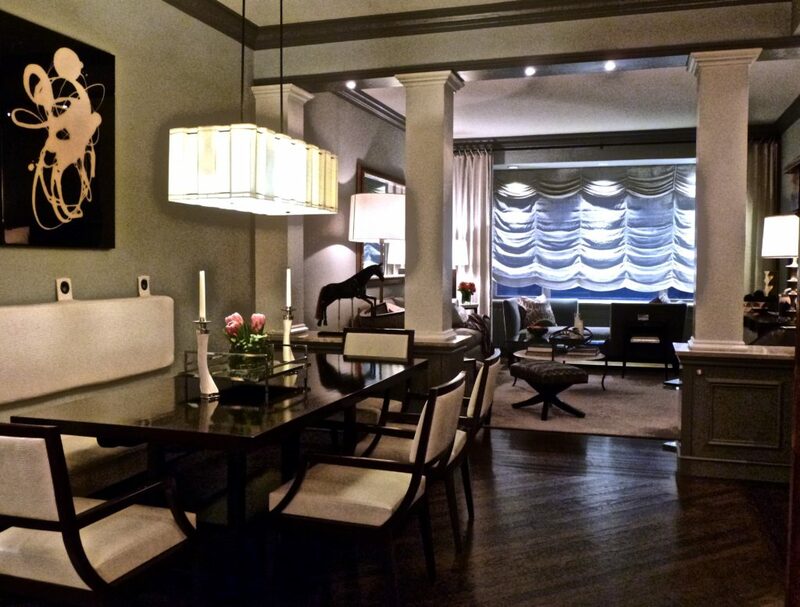 This separates the Dining Room and the Living Room in an elegant way while keeping the whole space open to the windows at the far end. The clean line modernist furnishings with a touch of Art Deco styling contrast with classical architectural mouldings and built in cabinetry. 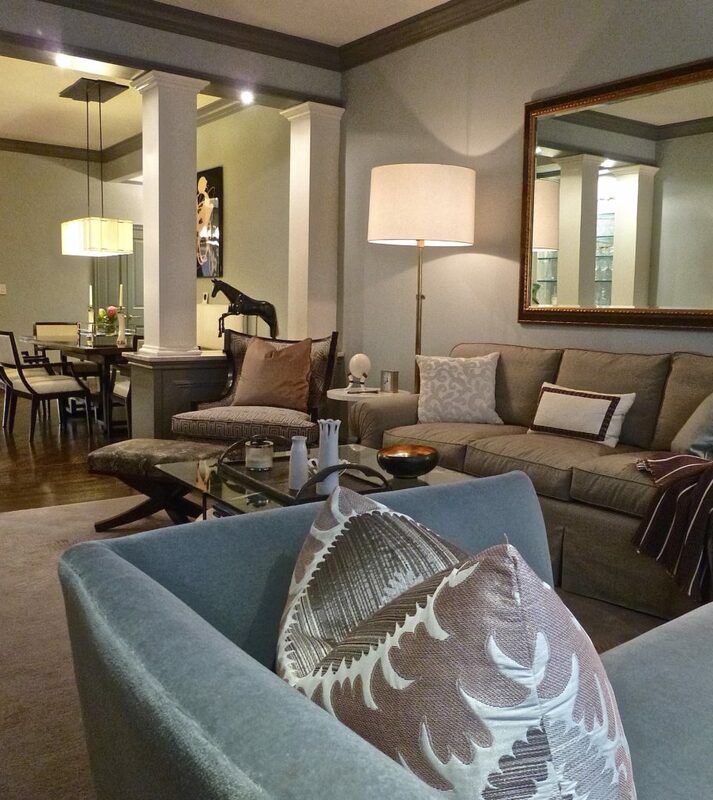 Floor to ceiling drapery highlights the high ceilings and lights over the sheer shades accentuate the folds as they come down to meet the built in cabinets below. 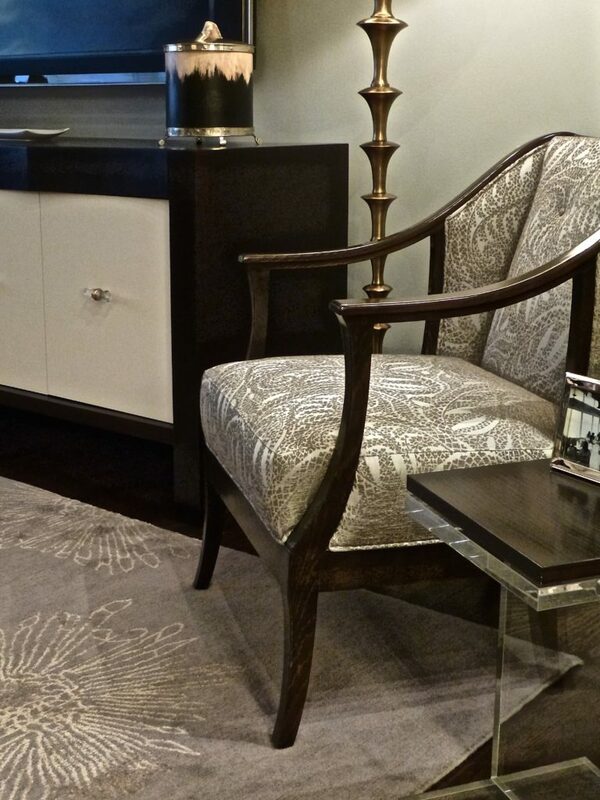 A contemporary hand knotted wool & silk rug sits beneath an elegant Deco chair. 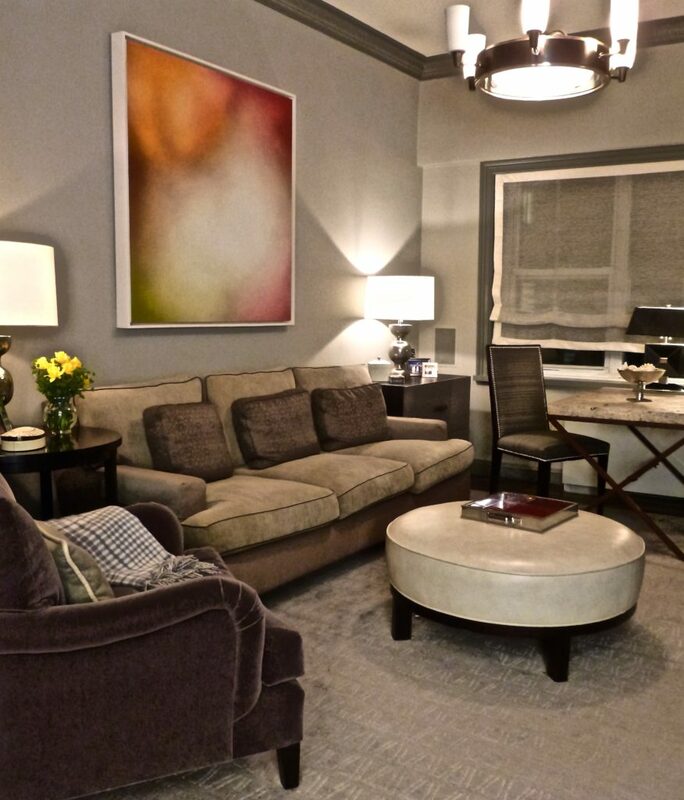 The subtle palette of cool to warm neutrals plays out in the upholstery fabrics. 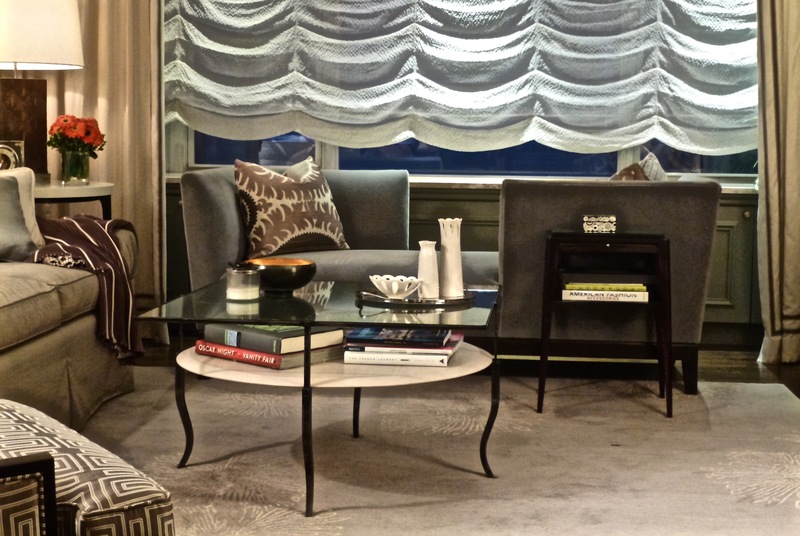 A blue grey mohair plush fabric covers a tête-à-tête chaise creating a great conversation nook by the windows. 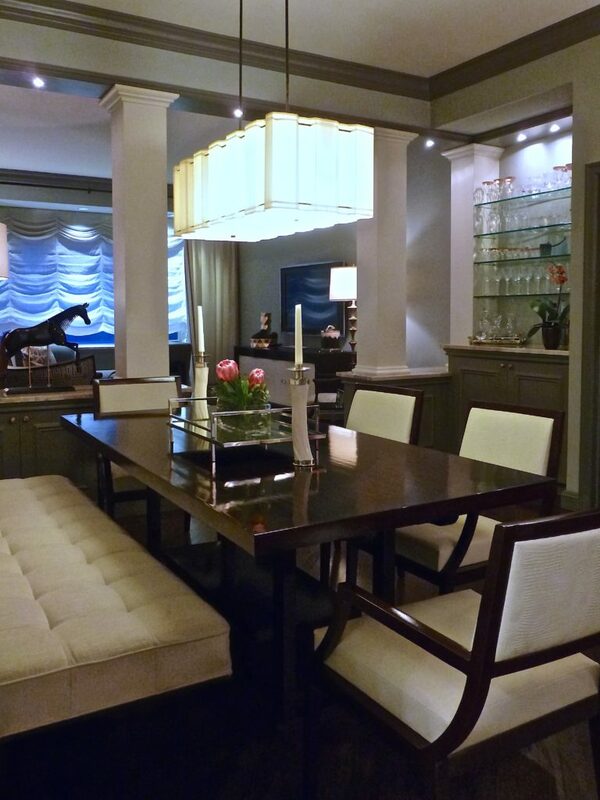 From the tete-a-tete one looks back through the columns to the elegant cream leather and walnut dining chairs. 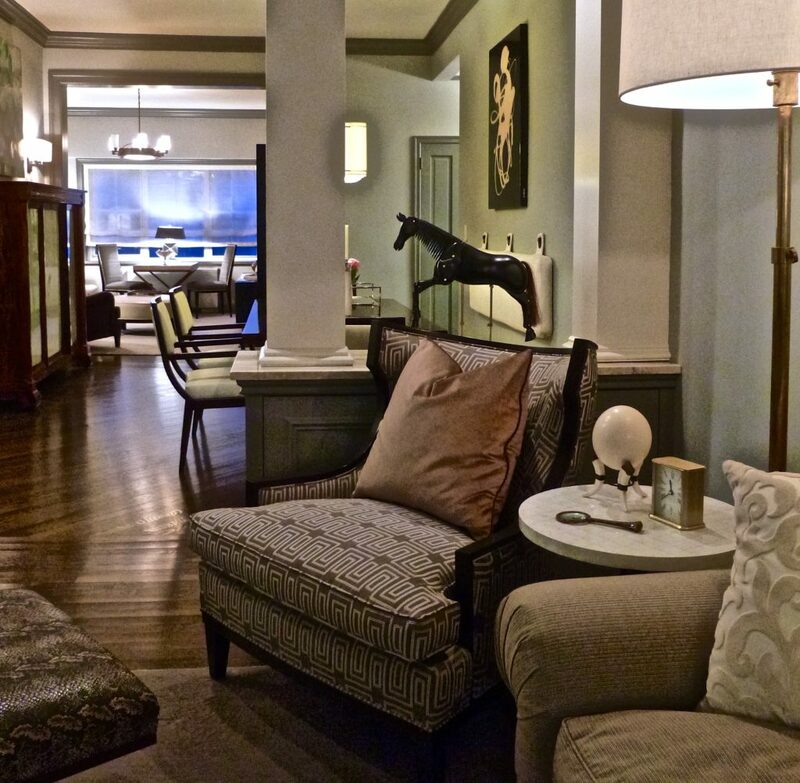 This view continues from the Living Room and Dining Room through an opening to the Den beyond. 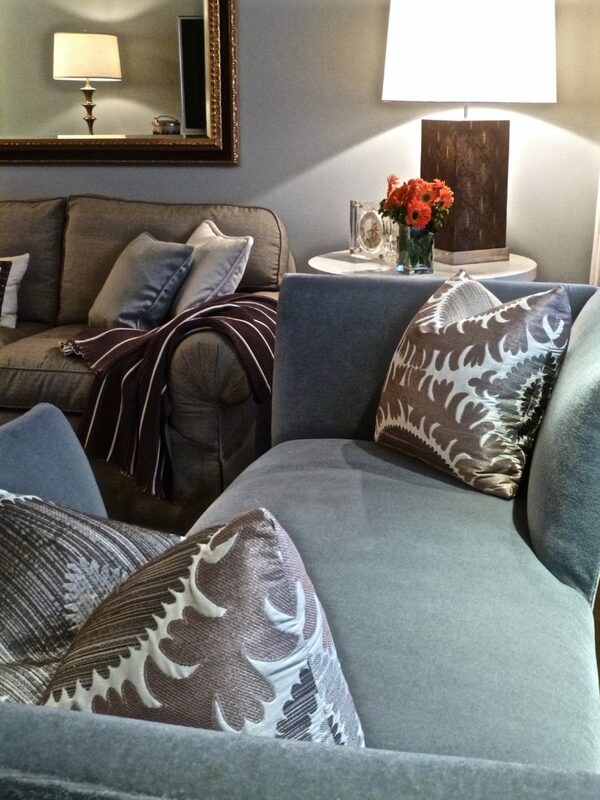 A medley of neutral fabrics was used on the sofa in the den. 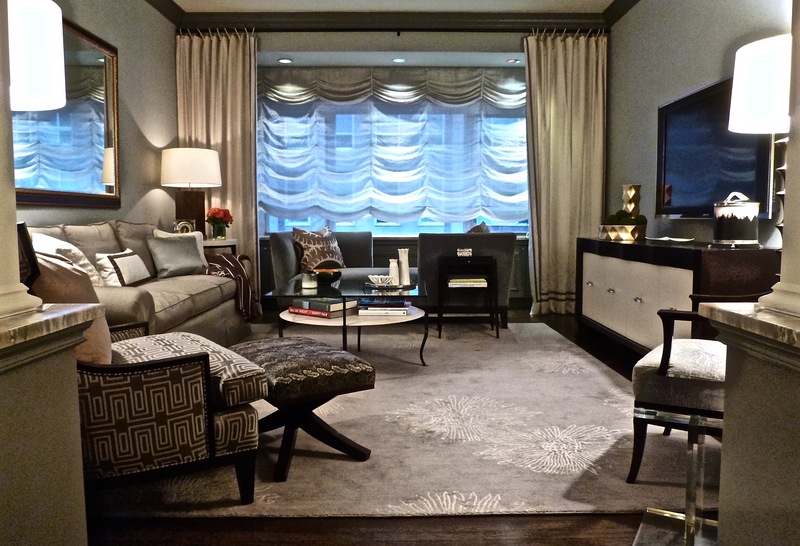 Dark accents connect with the dark mouldings and tonal wall colors. 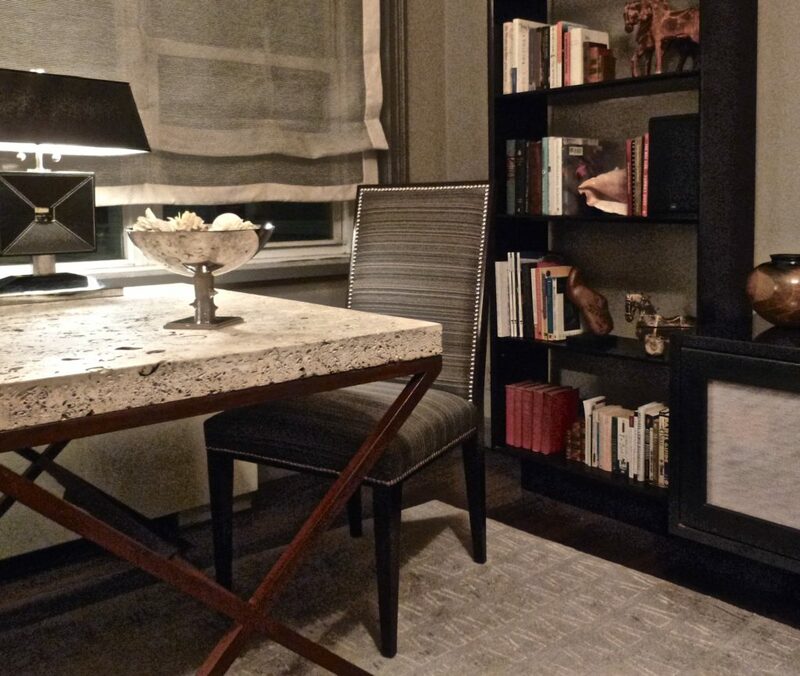 A heavy open pore travertine stone top sits 0n a rusted steel table base and is used as a desk or an eating area for two. 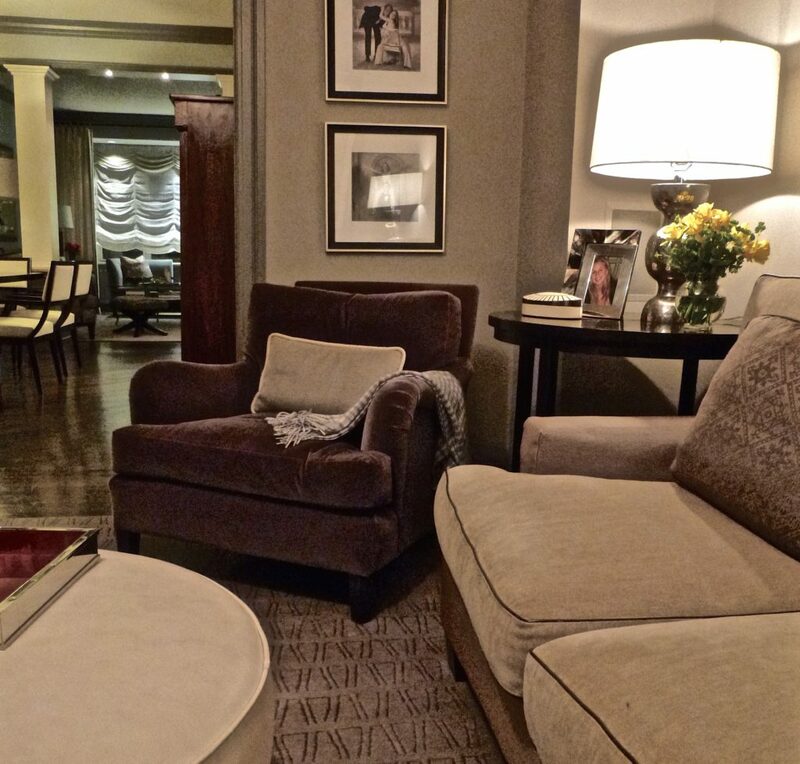 A richly shaded mohair lounge chair sits on another custom wool & silk rug. Looking back toward the Living Room gives you a view through the entire length of the apartment again. 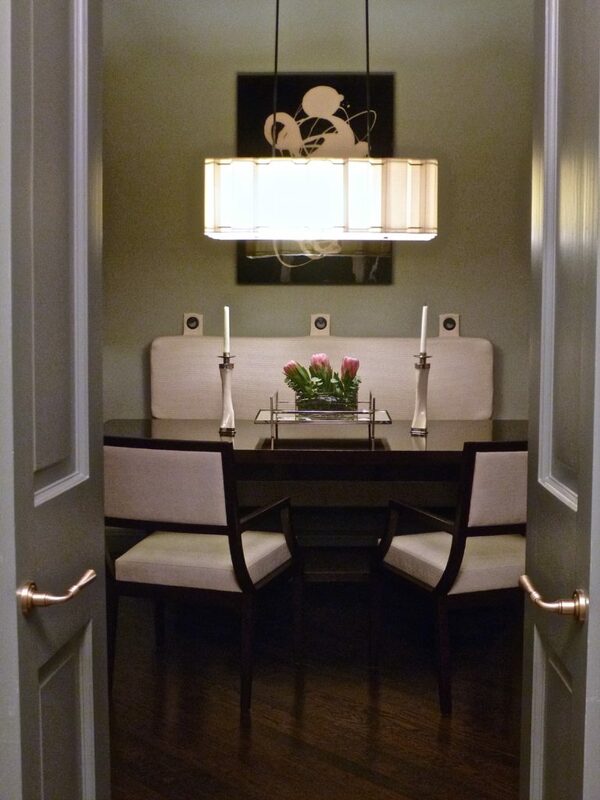 From the rear corridors through a pair of double doors you come to a perfect view of the Dining Room. 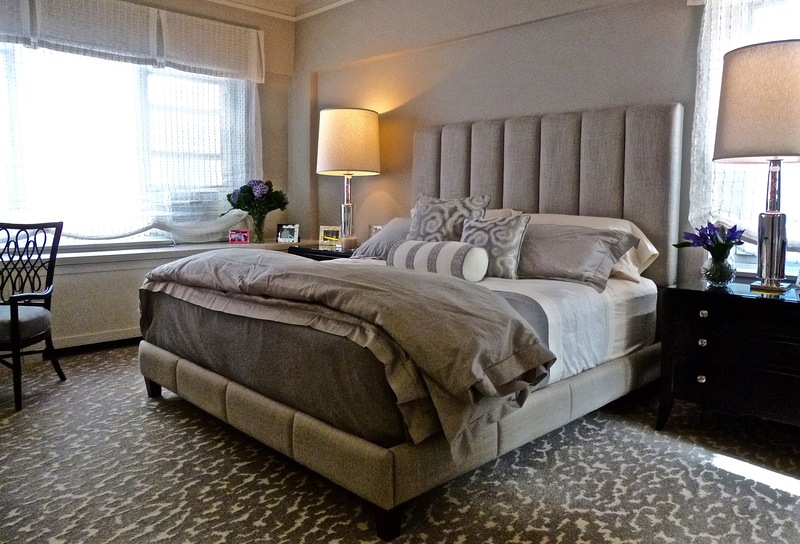 A patterned wall to wall carpet was installed in the Master Bedroom. 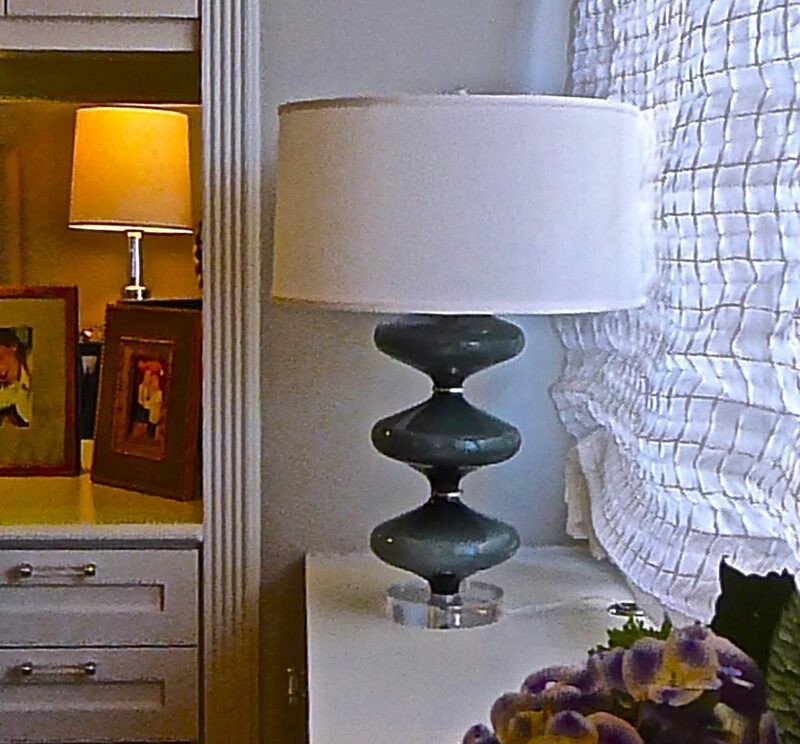 As you enter an upholstered bench sits under a single sconce just outside of the walk in closet and a night table and tall bed side lamp is centered on the window. A lighter note is struck in the Master Bedroom with pale grey walls and off white woodwork while keeping to a neutral palette. Deep accents like the dark wood night tables maintain the contrast. 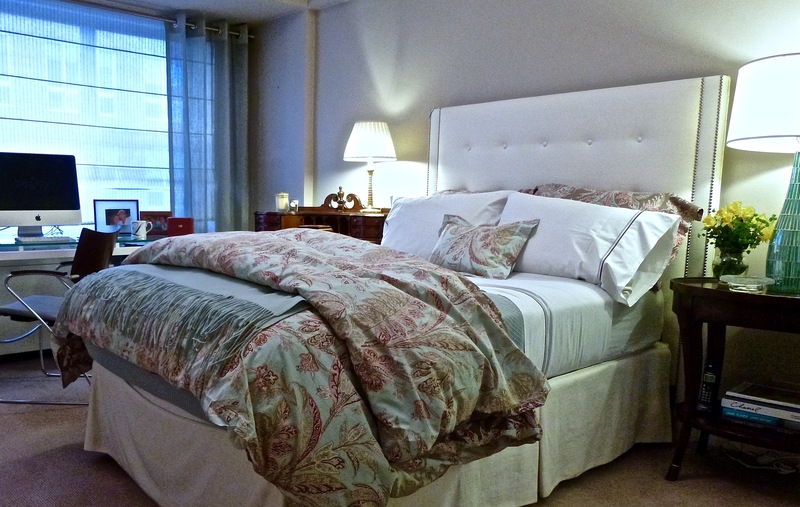 The custom designed upholstered bed and headboard continues the mix of Deco, classic and modern elements in the main areas. 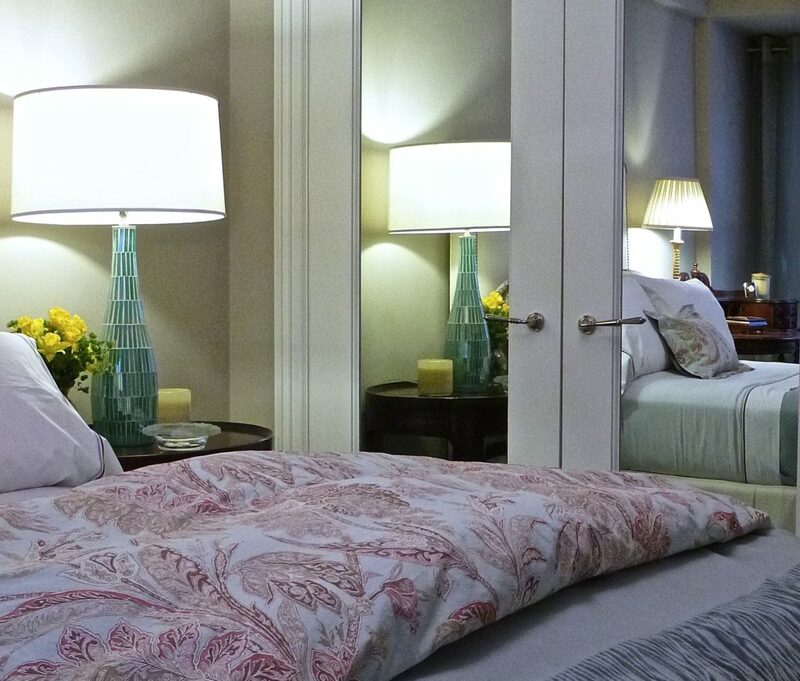 The details of woven patterned silk pillows and square tucked sheer linen shades continue the elegance of the main areas. 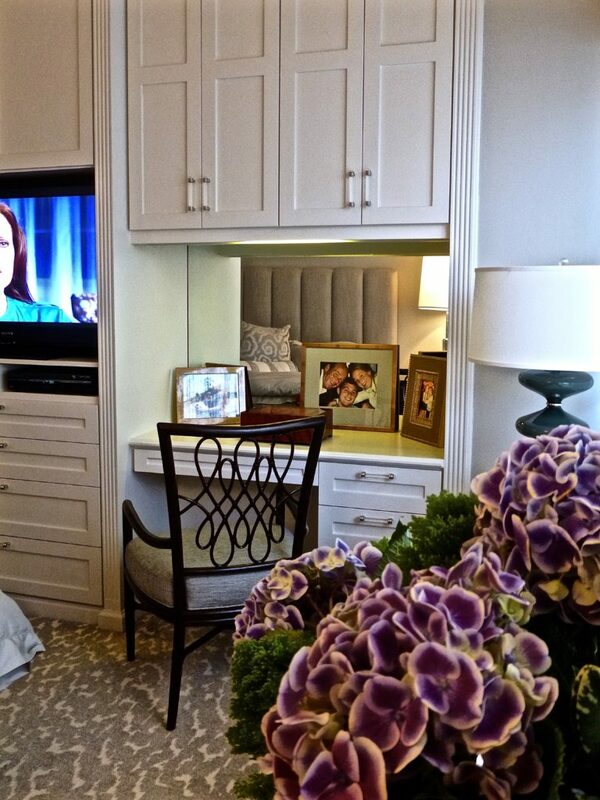 Existing built in cherry cabinets were painted white to lighten the room and new lucite handles were added to catch the light. A McGuire desk chair provides a bit of modern filigree. The square tucks in the linen shades create texture and soften the light while a grey glass lamp provides a sculptural touch. 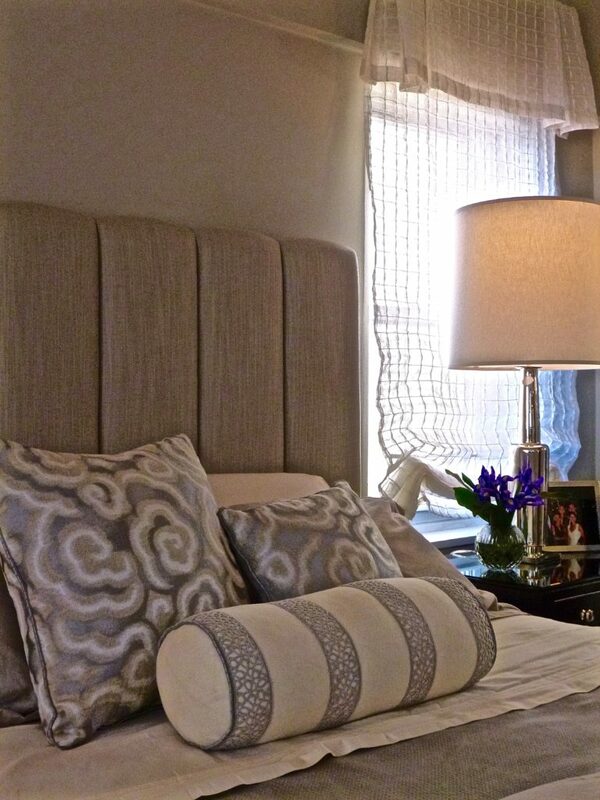 In a daughter’s room a custom white leather headboard with polished nickel nailhead brightens the room. 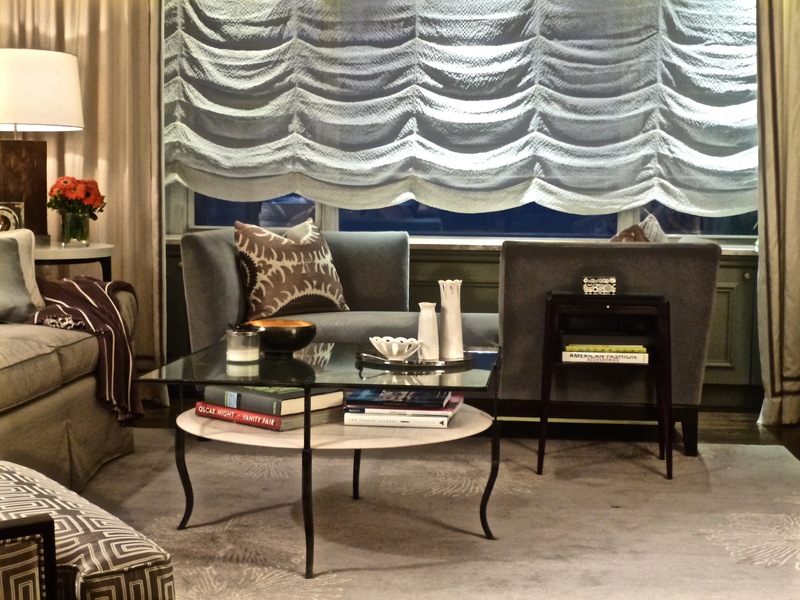 Drapery hung on a silver rod with grommets and a roman shade in pale green sheer linen dress the window wall. 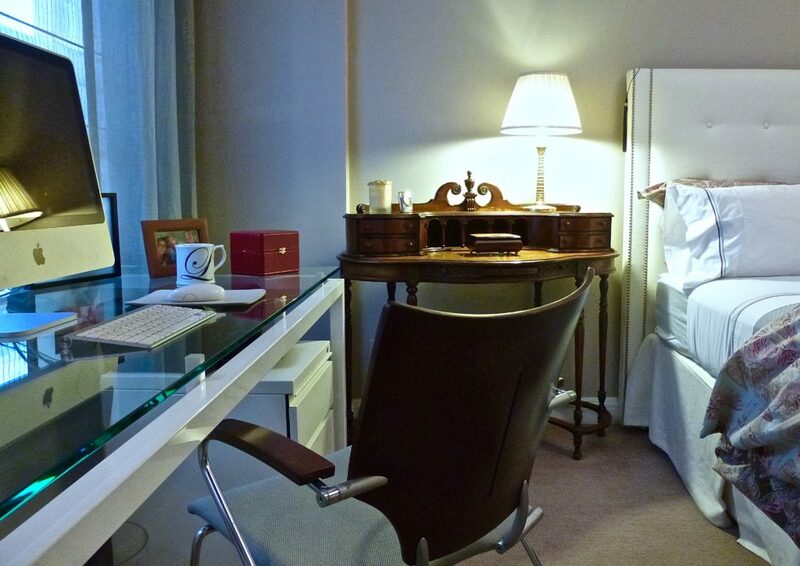 A contemporary glass top desk with a wood, silver mesh and aluminum desk chair contrasts with an antique night table. 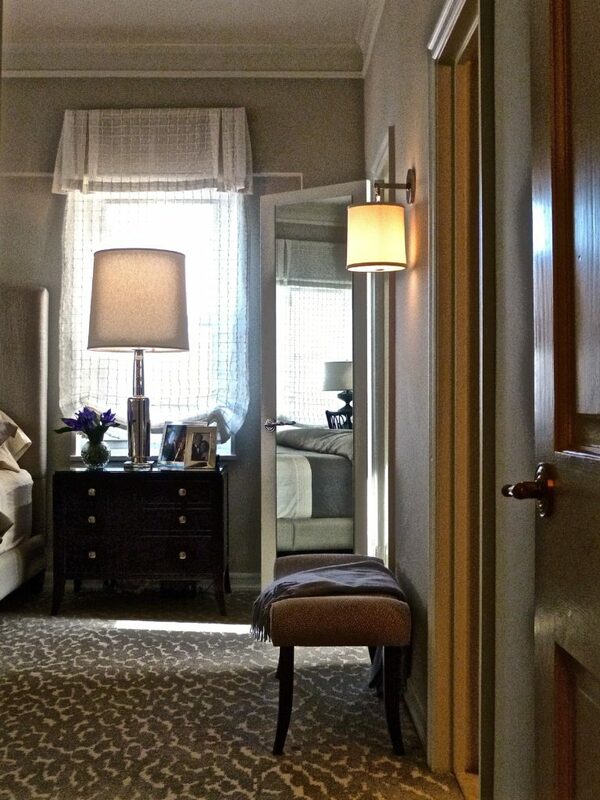 Inset mirrors on the closet doors reflect the light of the windows bringing it back into the room.